Recent incidents involving Ray Rice and Adrian Peterson have sparked a fierce blaze of indignation among critics and fans, but sadly, they are nothing new for the NFL. As much as league commissioner Roger Goodell deserved public excoriation, he’s far from the first to let stars who commit abuse off the hook; nor is Goodell’s leadership the real issue here. No, the league’s domestic violence problem is rooted in a broad culture of violence that players, coaches, fans, and journalists alike have created and perpetuated. For that, everyone associated with the NFL, except the undefeated 1972 Miami Dolphins, ought to be ashamed. Yes, thugs like Ben Roethlisberger and Dez Bryant are reprehensible, but so too are those of us who tacitly condone their behavior. It doesn’t matter how casual a fan you are—you’re not exempt from blame unless you’re Bob Griese, Earl Morrall, legendary coach Don Shula, or one of the other members of that glorious world champion Dolphins team. We can no longer pretend football in America is anything but a celebration of unapologetic aggression, insane masculinity, and stark brutality. Football is not an alternative to violence. It’s a vector of it, a perennial advertisement for it. Everyone is guilty of accepting this. …you’re not exempt from blame unless you’re Bob Griese, Earl Morrall, legendary coach Don Shula, or one of the other members of that glorious world champion Dolphins team. 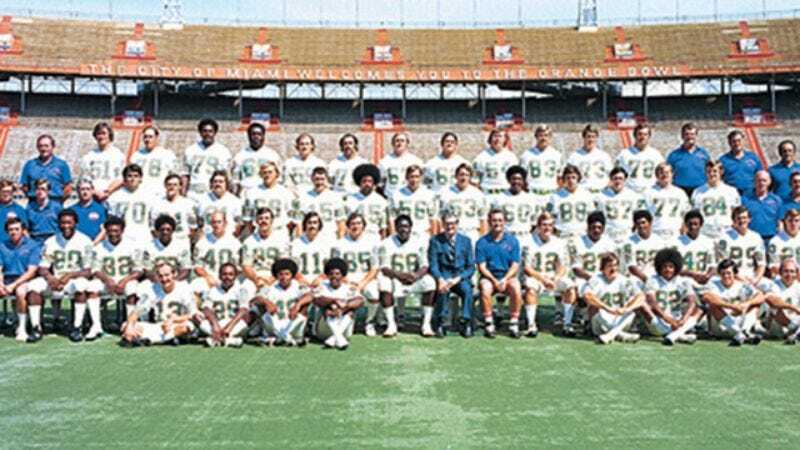 But the ’72 Dolphins—now there was a team that knew how to win! They went 17-0: a perfect 14-0 regular season and a 3-0 playoff run culminating in a Super Bowl victory. It’s a feat that, more than 40 years later, no other NFL team has reproduced. And let there be no grousing about the Dolphins’ allegedly “weak” schedule. Regardless of who your opponents are, winning 17 consecutive games—in a season so physically grueling that you have to wonder if players’ safety ever mattered to the football community—is the mark of an indisputably great team. Ultimately, the comforting narrative we tell ourselves is about a once-chaste league that has now fallen from grace. In truth, though, football has always celebrated brute aggression, even going as far back as the ’72 Dolphins’ punishing fullback, Larry Csonka, whose very name struck mortal fear into the parade of inferior teams that tried and failed to inflict even a single loss on that juggernaut of a Dolphins squad, perfection incarnate, unimpeachable kings of the gridiron. A team that doesn’t have to apologize for anything.